17 Years in the Classroom: Our Continuing Education Training Program is Still Going Strong! 2019 will be one more year for Mike’s Auto Body’s Continuing Education (CE) program, featuring another slate of informative classes. They continue to attract insurance agents from all over the Bay Area. Since 2002, Mike’s has been hosting CE classes that cover different aspects of the collision repair, insurance claims process and other relevant topics that enhance insurance agents knowledge in ways that can be used to build a stronger rapport with their policyholders. There are only 30 seats available for each class, so if you’re an insurance agent that is interested in attending, please go to www.mikesautobody.com and see the entire schedule of CE Classes, and sign up for thr classes at www.mikesautobody.com/insurance-ce-training/. Classes are held throughout the East Bay, including Rossmoor in Walnut Creek, Brass Door in San Ramon, Mike’s ADAC facility in Antioch, SM Conference Center in Concord, Fairfield Chamber Room and PPG Training Center. As part of Mike’s Auto Body’s continuing efforts to offer exciting and educational CE classes, Sal Contreras and Dane Dearlove have been instructors within the program for many years and are always looking to make their presentations informative, entertaining and interactive. Sal and Dane do everything that they can to get the agents engaged and actively participating in the discussions during every class. Sal explained. “It makes for a more dynamic classroom,” he said. We also offer classes online for the agents that cannot attend the live classes. Our goal , as a true partner, is to make this information available to more agents, so that they can take advantage of these informative classes. Anyone can sign up for the online classes at our website as well. Everything is offered at a no charge basis. For a complete schedule of Mike’s Auto Body’s CE Calendar of Classes, go to our website and access this page: www.mikesautobody.com/insurance-ce-training. They are listed under the Community tab from our Home Page. Adept at multi-tasking and performing a wide range of marketing tasks, as well as accepting all challenges that come her way, Virginia Kuiper is already excelling as our newest Executive Marketing Assistant at Mike’s Auto Body. She presently works out of our Concord VDM under the direction of Marketing Manager Dane Dearlove and IT Director Rick Rehm. Virginia was hired at Mike’s more than three years ago as a Customer Service Representative (CSR) working out of our Pittsburg Call Center. A graduate of Liberty Adult Community Education Center in Brentwood, Virginia, 22, was a restaurant hostess, server and held various retail jobs before working part-time as a pizza delivery person while looking for permanent employment. After going through the CSR training and learning on the job, Virginia used her communication skills and engaging personality to placate customers who were in an accident. A CSR at Mike’s Auto Body is a whole lot more than just a front desk person answering the phones. They represent the backbone of any shop’s daily operations; a mixture of administrator, teacher, customer liaison, paperwork expert, the face of the company and the very first person that most clients will interact with. Virginia’s duties as an Executive Marketing Assistant include monitoring and creating new posts for the company’s social media (primarily Facebook); coordinating e-touch reports; creates Excel reports concerning several aspects of the company, including financials and car counts, setting up meetings; changing information on the company’s web site and helping out when it comes to our Continued Education (CE) classes. When she isn’t working at Mike’s Virginia has a wide range of hobbies and interests. She likes anime and video games and enjoys hanging out with her friends. She also likes collecting popular bobbleheads called Funko Pops, especially from one of her favorite shows, My Hero Academia. Virginia also enjoys dressing up like some of her favorite characters and attends Comi-Con, Anime Expo and other comic and video game conventions. She also enjoys good restaurants, and some of her favorite things to eat are crepes and seafood, just to name a few. 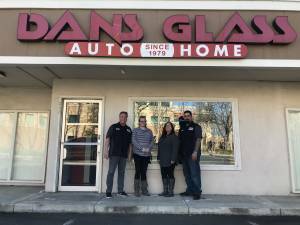 Owner Dan Mazzoncini at Dan’s Glass, Inc. in Concord, CA has a long and mutually satisfying relationship, both personal and professional, with Mike’s Auto Body and the Rose family that started way back in 1981. With nine employees and a fleet of six trucks, Dan’s Glass does commercial, residential and automotive glass installation and repair in most of the cities where Mike’s has locations. Celebrating its 40-year anniversary this summer, Dan’s Glass has installed, replaced or repaired glass at nearly all of Mike’s Auto Body’s locations at one time or another. The window replacement team at Dan’s Glass specializes in storefront and commercial window glass replacements, but automotive glass is also a significant portion of its workload. Dan met Mike Rose in 1981 through a mutual friend who was a painter and the two began working together almost immediately. At that time, Mike had only one location on Fremont Street in Concord and now the company has 16 locations with two in Concord and Walnut Creek and one in Lafayette, Pittsburg, Antioch, Alameda, Brentwood, Richmond, Fairfield, Napa, San Ramon, Fremont and Vallejo. As the business has grown, Dan’s Glass has been there to provide exemplary customer service every step of the way. When it comes to auto glass installation and repair services for Mike’s Auto Body, Dan’s Glass replaces or repairs windows and windshields for vehicles that Mike’s are fixing after a collision or other mishap. This includes chip repair–a cutting-edge process where a clear resin is injected into a window’s crack to prevent it from spreading. Dan’s also performs R & R (Remove and Replace) where windshields are removed while the car is painted and then subsequently re-installed. When Dan Mazzoncini isn’t running his company, he works on his collection of 45 motorcycles (all Kawasaki’s) and three classic cars, including two Camaro’s and a 1967 Corvette. The Founder and Owner of Mike’s Auto Body Mike Rose values his company’s long-term relationship and Dan’s Glass, “Dan’s been doing our work for 30+ years and Dan’s Glass is a very professional business that stands behind whatever they do, and that’s why we always highly recommend Dan’s,” he said. With a willingness to do whatever it takes and the dedication that’s needed to be the best, Jennifer Harriman has impressed her fellow employees, customers and associates at Mike’s Auto Body from day one. Twenty-one years ago she was hired, and although her role and job title have changed over the years, Jennifer is an important and integral part of the team at Mike’s. She has seen the company grow from one location to 16 and witnessed our journey to success every step of the way. To be the best in the collision repair industry, we need top people and Jennifer fits the bill in every way imaginable. As the company’s Compliance Manager, Jennifer manages 30 Customer Service Representatives (CSRs) and 16 Office Managers with the goal of guiding and mentoring each and every one. It’s a huge undertaking and the hours can be long in some cases, but she loves her job and isn’t afraid to take on every challenge that she encounters with enthusiasm. 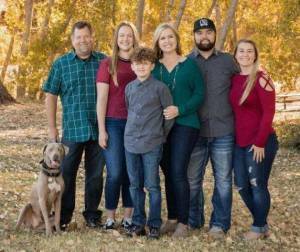 When she isn’t wearing numerous hats at Mike’s, Jennifer maintains a busy family life, consisting of her husband Mike and three children. 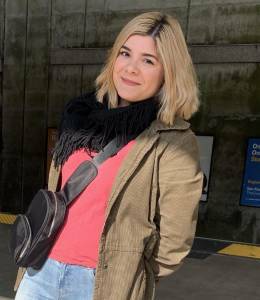 Her oldest is her stepdaughter Tayler, 26, who works as the Adminsitrative Assistant to the President at the Academy of Arts & Sciences in San Francisco and enjoys music and roller skating. Her middle child is Tommy, 18, who is working to be an electrician and loves dirt biking, snowboarding and working on his truck. Her youngest, Trevor, 13, wants to be a successful entrepreneur and business owner down the road. He is in the 8th grade and will be attending Liberty High School in Brentwood in the Fall, and plays AAU basketball and enjoys snowboarding. Jennifer’s husband Mike works for a company that makes robotic inspection equipment and Jennifer’s mom Robin worked for Mike’s for the past 25 years before retiring recently. Thanks Jennifer Harriman for playing a major role here at Mike’s Auto Body and emulating our company’s motto every day, “One Team, One Mission”. 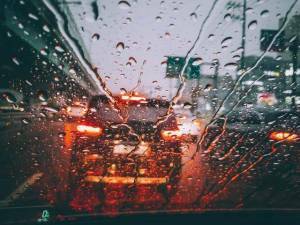 With all of the rain and wind hitting the Bay Area this week, all of us at Mike’s Auto Body would like to share this helpful safety information with you. On December 12th, Christmas came a little early for five deserving families as Mike’s Auto Body and local companies worked together to make life a little easier for those less fortunate. This year’s slogan was “A Gift of Charity Wrapped in Dignity” as Mike’s Auto Body commemorated the donation 79 cars since 2000 through its nationally acclaimed Benevolence Program. Each year the collision repair industry as a whole comes across cars that are “written off” by either the owner or the insurance company. Often times these are older vehicles that just need some mechanical and body work to get them back on the road and perfectly safe to drive. Because we believe these cars are going to waste when there are people who really need them, we decided to do something about it. CSAA Insurance Group, Farmers Insurance, State Farm Insurance, Liberty/Safeco Insurance and Enterprise Rent A Car participated this year in the December presentation by donating “written off” vehicles that were given away to five deserving families. 200 people attended the vehicle presentations at Mike’s Auto Body’s ADAC facility in Antioch on a day filled with sunshine and the Christmas spirit. The day always starts with a hearty welcome from Benevolence Ambassador Sal Contreras followed by with an invocation by Pastor Felix Golden. Then there was a flag presentation from the Mt. Diablo JROTC Color Guard; America the Beautiful was presented by Bagpiper Kristopher Muse and then Sandie Browne sang the National Anthem. Then Mike’s Auto Body’s Director of Marketing Dane Dearlove spoke about “Who We Are” and how Mike’s continues to give back to the community, followed by welcoming remarks from Antioch’s Mayor Sean Wright before the five car presentations took place. Another highlight of the day was when the Contra Costa Firefighters of Antioch’s Station 81 led by Captain Jeff Landis, delivered Santa to the presentation in their fire engine, who then gave brand new bicycles and helmets to the children. As always, local insurance agents filled all the vehicles with gifts and toys for the families. · A single mother with two daughters, Patricia Castellanos, received a 2013 Nissan Rogue that was donated by State Farm; sponsored by Sparkpoint Brighter Beginnings in Bay Point; re-furbished by the crew at Mike’s Pittsburg location and presented by State Farm’s Mike Stoiber. · 24-year-old Ally Jenkins received a 2016 Toyota Prius that was donated by Safeco/Liberty; sponsored by Cortona Park Senior Living Community; re-furbished by the crew at Mike’s San Ramon location and presented by Safeco/Liberty’s Tom Donahue. · A single mother Erika Quinteros received a 2018 Ford Fusion that was donated by Enterprise Rent A Car; sponsored by California Promise Innovation, Contra Costa College; refurbished by the crew at Mike’s location in Antioch and presented by Enterprise’s Kelly Hunt. · A single mother Maria Barraza received a 2014 Honda Civic that was donated by Farmers; sponsored by the Hemophilia Foundation of Northern California; re-furbished by the crew at Mike’s North Broadway location and presented by District Manager Dan Brown from Farmers. · A single mother/grandmother JoAnn Segura received a 2015 Toyota from CSAA, sponsored by the Housing Authority of Contra Costa County; re-furbished by the crew at Mike’s Fremont Street location and presented by CSAA’s Victor Cordon.